I mean, every day I go out to cafes and buy myself the heavenly cup that will fuel me for my day. Had I not found out about gooseneck kettle, I think I might be having problems with my budget right now. I know what you’re thinking, why do I want to invest in something that looks totally hipster when I could just buy instant coffee and pour hot water over it or get myself an espresso machine? Well, nothing is better than the great taste of pour over coffee. So, sit back and relax, my fellow coffee lovers and allow me to help you understand why this is sacred to our coffee-loving ways. You have to understand that acquiring the right pour over coffee means getting your hands on the right kind of kettle. It’s not just the brewing, it’s the kettle too. But Wait! Why Pour Over Coffee? 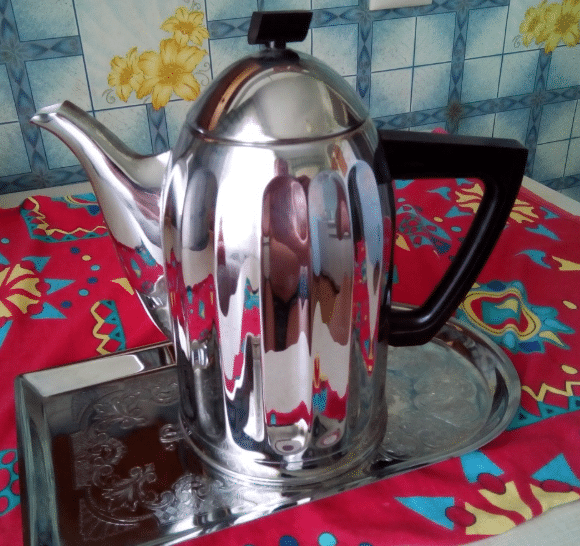 So, before we dive in headfirst to why I think you should probably get yourself a gooseneck coffee pot– I swear to you for the nth time, it’s a GREAT investment for a coffee lover- I think you and I should probably discuss why I’m raving about the gooseneck kettle. Here’s the tea, for so long I would go into coffee shops and buy myself a cup. 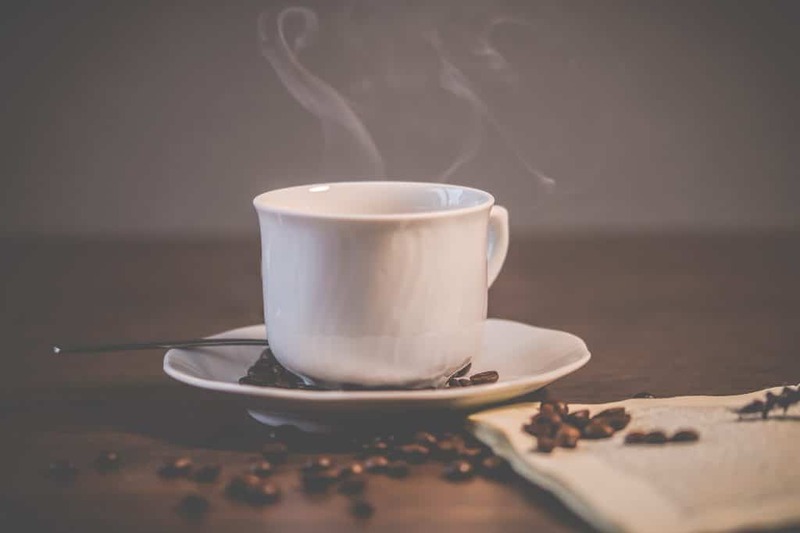 It smells great- that aromatic coffee wafting to your nose as you find yourself a seat in the coffee shop – and you’re excited to finally have that cup of coffee that would run in your veins and fuel you to face the day. And then you take a sip and oh no, it’s stale! See that’s the issue that we have there. Coffee makers and pots and French press, they’re great, I know and I’m not going to fight you on that if you think that they’re amazing. But sometimes the coffee sits too long on the counter before someone else pours another cup for himself and then it’s not as delicious as it’s supposed to be. So maybe you’re not the kind of person that doesn’t mind having a stale coffee as long as you have caffeine in your system. Maybe you’re not that strict when it comes to the heaven-sent brown liquid that fills your veins with the kind of rush you need to get through the day. Maybe you don’t really give a crap about what it tastes like for as long as you’re in a coffee shop and you have yourself a hot date and it doesn’t matter if your coffee isn’t as hot. But it mattered to me. 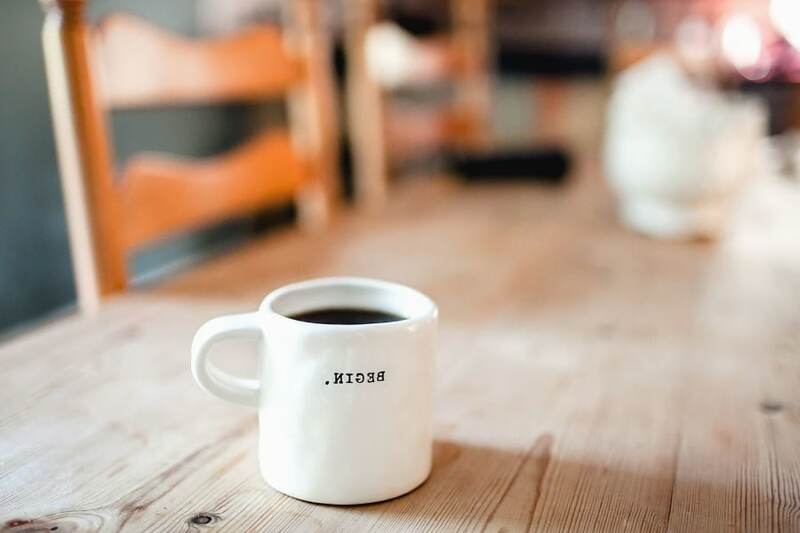 For so long that had been my issue and for some time, it felt like I was spending my money for stale coffee that doesn’t satisfy my coffee-loving heart. Evidently, I befriended the barista at the new café that I found that served the best coffee I’ve ever had in my life. 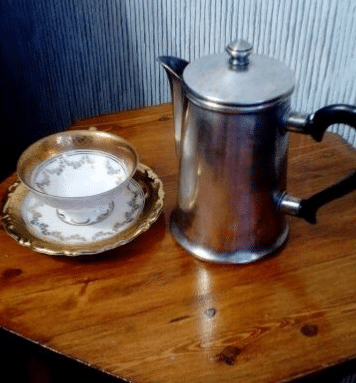 One of the things I’ve noticed with this café was that while it did have a coffee maker, the barista sometimes goes around carrying this silver kettle and pours a cup for those calling her. It was then that I realized that maybe I needed to be friends with this person because I needed to know why their coffee tasted different. So maybe I had an agenda with befriending her, but I didn’t care. I was spending too much of my salary on coffee that it has dented a hole in my budget, and I needed to figure out the right way of doing this thing. I needed to take my caffeine-addiction at a serious level. That was when she told me about the pour-over method that her boss wanted to try out. According to her boss, it was pretty simple. She liked to call it the grind-and-pour method of coffee making, and it went really well because there had been tons of satisfied customers. The process was pretty simple, really. You simply grind the beans, make sure you have the right ratio for coffee beans and water- this is actually crucial to this whole approach of coffee making – and pour thoroughly filtered water in and it would result into a consistently tasteful cup of heaven-scent liquid. But wait, there’s more. You can’t just use traditional kettles, she told me. I didn’t understand what she meant by that at first. I mean, what difference would a kettle make? It turned out that the kettle made all the difference. You would want a consistent heated water temperature for your coffee, she said, and that could only be acquired if you buy this specific type of kettle that would give you that. 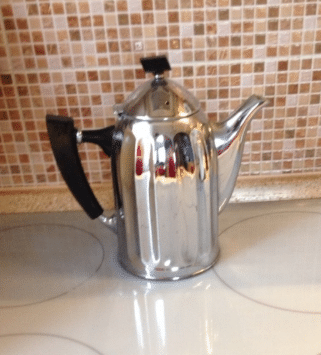 The gooseneck kettle. I did a little digging of my own for this one. I knew that I was asking a barista, but I didn’t want to dive in headfirst to an investment that may or may not be a good idea. I needed to do my research about this gooseneck coffee pot and needed to make sure that I was going to make the right decision by getting myself one. I needed to understand why this thing became key to making the coffee taste incredibly good. I needed to understand all the whys’ and how’s and whether or not this was all legit or I was being fooled by a barista. I wanted to know if this was worth my money. Upon my research, it had come to my knowledge that maybe this would be the greatest investment I will ever make in my coffee-loving life. Suddenly, it occurred to me that I would no longer need to make a coffee-run in town, wake up earlier than I intended to just so I could head to the café and have a cup before I head off to work. It occurred to me that the amount of money I spent of coffee would no longer take too much of the pie-graph budget I make for myself. This might just very well be the very thing my frugal self never thought she needed. The investment what change my life forever. The very purchase that will be worth it for me and for some reason, I just never thought that I would ever end up buying something called gooseneck kettle but maybe that’s just how life is. So, finding the right kettle for you isn’t sunshine and rainbow kind of thing. There are a lot of things to be considered and I know that may come out as a shock because what do you have to consider when you’re looking for a kettle? Well, you can’t have a kettle that lacks pouring control, burns your hand or releases substances that aren’t meant to be in your coffee therefore also not meant to be in your system. Trust me, I felt just as overwhelmed as you do when I was first looking for mine. I could barely grasp the idea that the kettle made all the difference but if that café consistently served me the kind of coffee that made my insides melt by the consistent way it tasted, then I didn’t want to take a chance and get myself a kettle that wouldn’t give me the right coffee fix. It also isn’t just about finding the right one, but about finding the best one that you can get your hands on. See, the brewing process isn’t the only thing that makes your coffee taste great and it’s not just the coffee bean you use. You will never acquire the right pour over taste if you don’t use the gooseneck kettle nor if you used it in a sloppy manner. Pouring becomes an art when you have a gooseneck kettle in your hands. If it’s art then, you need the best, right? So, I’ve done you all a favor and rounded up the gooseneck kettles I deemed as the best when I was scrounging out one for my own. This is to help you choose when you’re stuck in “should I get the electric gooseneck kettle or the stove-top gooseneck kettle?”. Trust me when I say that there’s a wide variety of gooseneck kettles to choose from. There are gooseneck kettles with thermometers, electric, and stove-top ones. I wasn’t kidding when you I said I wanted to help you out of your dilemma. Us coffee lovers? We have each other’s back. You’re welcome! Don’t you just love technology and innovation? Coffee Gator Pour Over kettle is engineered with medical-grade stainless steel gooseneck kettle? But do you know what makes this one better? It has a built-in thermometer! 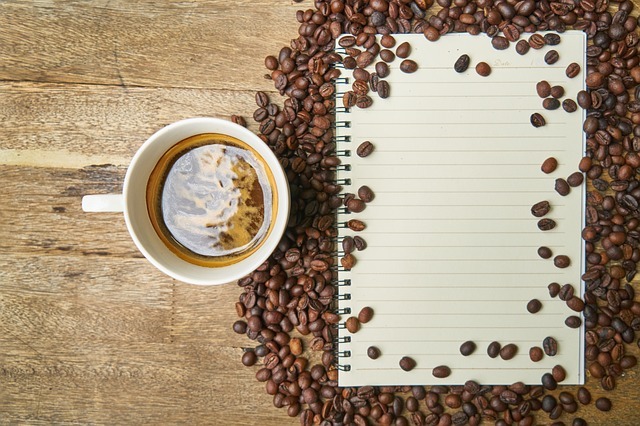 Making yourself a cup of coffee might sound like an easy task to do but if you’re the kind of person that’s looking for the right coffee- *cough* unburned coffee beans *cough*- then you would know why the heat of water is essential for this whole ordeal. Too hot and you’re going to burn those beans of yours and who wants to waste a perfectly good coffee bean, right? With the built-in thermometer, you will no longer have to guess whether or not the temperature is right. This coffee kettle tells you when you’re in the right temperature! No more worries about burnt coffee beans! So maybe appearance-wise this isn’t a pretty display but who said anything about simply displaying this? This kettle isn’t meant to just stand there on the sideline and make your kitchen look pretty. No, sweetheart, this is meant to be used because why else would they make a gooseneck kettle that has a spout that was meant for smooth water flow to simply be used as a decoration? The thing about the smooth water too is that it’s essential for the hand drip perfection. 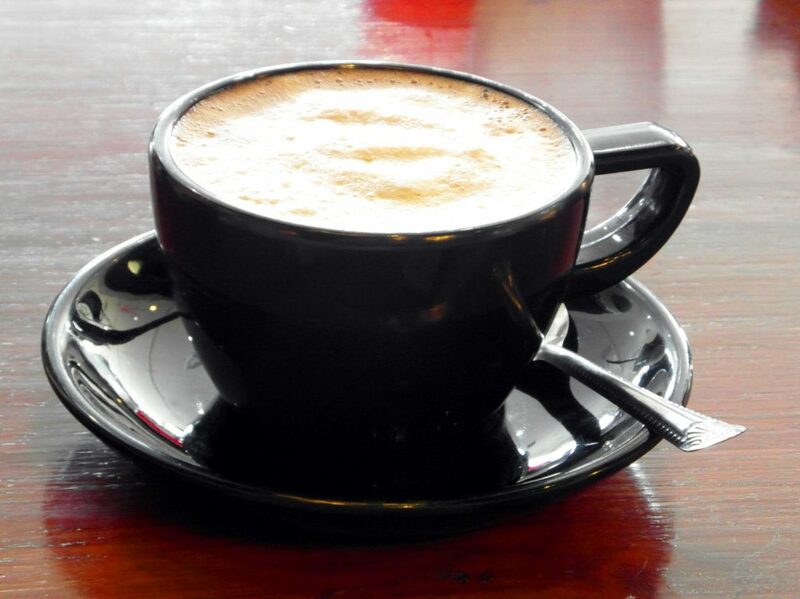 Perfection, that’s the kind of coffee you want to drink, right? But you know what makes this kettle even better? It’s uniquely designed with a triple-layer base. That means you can put it on stove-tops and by that, I mean all stove-tops. It stays rust-free too! Safe and innovative? Here, take my money! Not too huge but can hold for 2 cups of coffee. Heats up quick so you can serve someone else their cup. Can be placed on all stove-tops. Adhesive might leak in your water. With the advent of technology and the creative minds of people and the power of innovation, it has given birth to this electric water kettle. See the beauty of this one is that it’s electric. Simply plug it and wait for electricity to do its thing and heat it up. But there’s another feature that makes this even better. It’s cordless. You won’t have a wire dangling below when you pour it over a cup of coffee. You won’t worry about getting electrocuted! Another great thing about this? It shuts off by itself. Oh, Aroma Housewares Electric Water Kettle, you are outdoing yourself! All you have to do is press one little button- which has I mentioned is a one-touch operation? – and this thing boils and heats the water it contains inside and once it’s all done, it just shuts right off and finishes the job. It’s like it gives a signal to you that says, “I’m all done, you can use me now!” and I think that’s really great. And it isn’t just for coffee. Yes, you heard me right, this one isn’t meant for just coffee. You can make hot chocolate with it and instant noodles. Instant noodles! I mean, if it can be used on things other than coffee, then this would be like the best purchase you could ever make because it could be used a lot more. It also heats up really easily. With its design, it boils water twice as faster than if you put a kettle on a stove-top with 1000 watts. You wouldn’t be waiting around too long, just plug it on, turn on the one-touch button and wait until it shuts itself off. Oh god, I love that it just shuts itself off. But that’s the reason behind why it could be used on other things. Because of how fast it heats up, you can use as if it’s a traditional kettle. Just make sure that you’ll often use it for coffee because well, that’s what it was designed to do. What more is that it doesn’t look bad as a new addition in your kitchen. It’s surprisingly stylish for a gooseneck kettle, as stylish as this kettle could get. 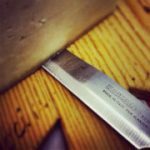 It doesn’t only make as a great new kitchen tool but also a good accessory for it too. Boils twice as fast than a 1000 watts stove-top. Can be used for hot chocolate and instant noodles and more. Automatically shuts off after boiling. Cordless so it renders easy pouring. It has an easy to use, one-touch operation. Stainless steel body and interior. Tight-fitting cap and relatively quiet when boiling. Bottom of the kettle is made out of plastic so it might cause a leak. I know, the name is a mouthful but it sure does give you a mouthful of heavenly goodness! You can always just call it the Hario Kettle, it would mean the same thing. What makes this one great, you may ask? Well, for one, the pour control is amazing. I’m not even kidding when I say that nor am I bluffing. The pour control is all about how well designed the spout is. We don’t call this gooseneck for anything, guys. Hario provides a thin spout that gives off a long-distance for the water to travel. Long-distance is good when it comes to pour-over coffee. It’s what pours the water at a smooth and consistent pace which would mean a consistent taste in your coffee. 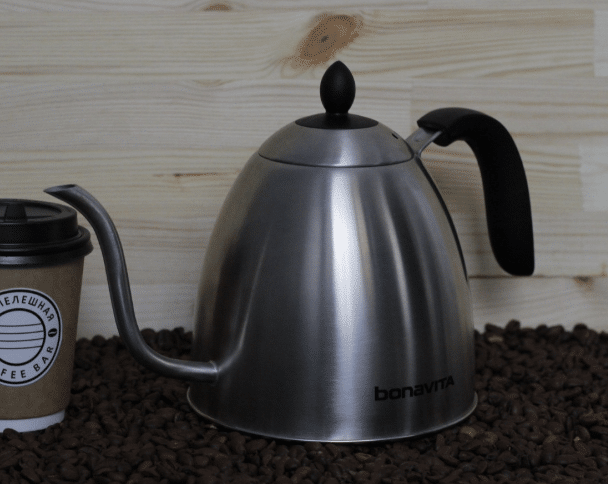 Consistency is key with this kind of coffee brewing and if you’re down for a consistent coffee taste then this kettle just might become your best friend. 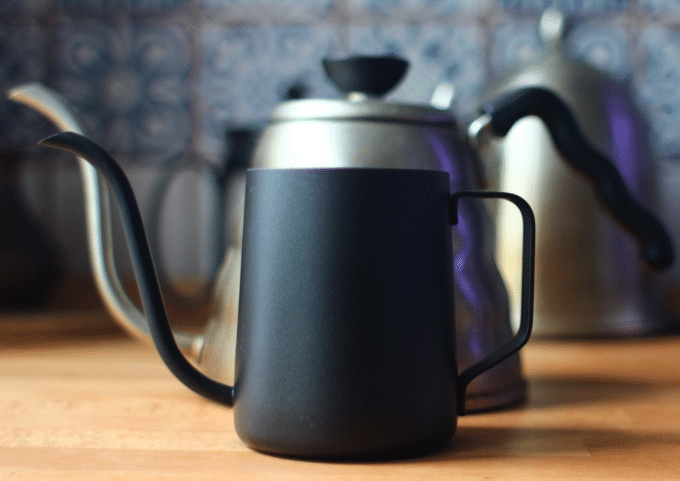 What makes this coffee kettle even better? Unlike the others, it can actually hold up to five cups of coffee. I repeat, FIVE CUPS. Five cups equal one coffee pot. If you have this product at home, then by all means, host a coffee party because it sure as well would become a hit! This kettle has the capacity of 1.2 liters which most probably explains why it could serve five more individuals or cups. You’re going to save yourself the trouble of having to heat water over and over again after two cups of coffee or having made one for yourself. Gone will be the days of late-night partying and drinking shots of tequila lined up on the bar counter. With this product in your kitchen, you can have that coffee-themed party you’ve secretly always wanted because it’s always more fun to stay at home and relax and actually talk to people. Hands down for this kettle, it’s not going to be a bad investment on your part. You get to serve five people AND you get to serve them coffee that has a consistent taste. Trust me, pal, you’re going to be the talk around the block with this one. Great pour control because of the finely made spout. Can serve five cups and holds about 1.2 liters of water. Can be used on any type of cooking surface, and that includes induction. Ergonomically designed handles that make it look stylish that other gooseneck kettles. It’s hard to clean which might be troubling. It’s going to take you a while to boil that water. Poor materials used for this product. Made in China version isn’t good. 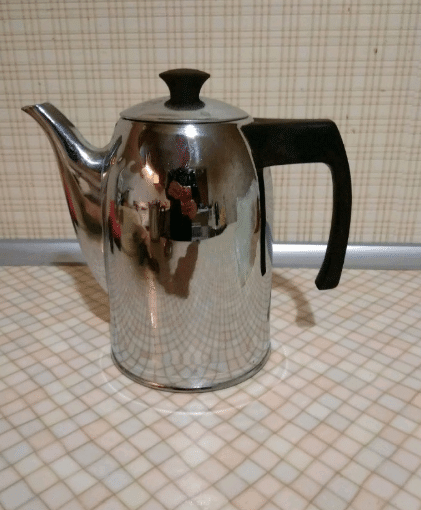 If you’re looking for a variable temperature gooseneck kettle, then this might be just this coffee kettle that you’re looking for. It heats the water at the exact temperature you need, and we all know that the water temperature is key when it comes to the taste of your pour-over coffee. Besides, this isn’t just meant for your coffee endeavors, this also makes you the perfect tea and that’s the tea about this one. The variable temperature is a thoughtful touch to be honest and a great added feature that other gooseneck kettles don’t have. You can adjust your temperature from 140°-212°F. The great thing about having variable temperature is that you can adjust it to whatever temperature desirable and suitable for you. Of course, there’s an optimum temperature meant for to achieve the pour-over coffee taste but then, that’s an option that’s open for you to take and it’s your choice whether or not you take it. I just personally think that the adjustable temperature is a very nice touch. The spout is also meant for precise pour control. We’ve been discussing pouring for the majority of this review, I’m sure by now you understand that pouring is essential with this kind of method just as how the temperature of the water is too. With that in mind, you do understand how crucial the spout actually is. Obviously, it’s crucial, why would they call it gooseneck if it wasn’t? 1000 watts means it’s the quick heating kind of kettle. So, you’re going to have that caffeine fix before you go to work and you’re not going to be the cranky co-worker or boss that you turn into if you don’t have coffee in your system. See, it’s quick, consistent and efficient! The spout has precise pour control. It doesn’t last very long. It isn’t made from stainless steel so rust can easily accumulate, rendering it useless after a while. 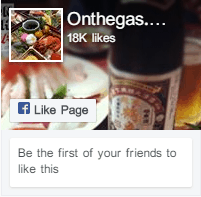 Poor quality control and design. In a world where everything seems to be lived in the fast-paced lane, sometimes you just need a cup of coffee to get through the day. But the thing is, there is so many wide varieties of coffee to choose from that you lose the sense of whether or not you’re getting yourself a cup for its quality and not because you’re in dire need of a caffeine fix. Maybe the latter is more common but if your heart yearns for the right blend of coffee beans, for the right temperature, for consistency that would make you close your eyes and enjoy that tasteful liquid that would wake you up and get you through the day, then you can’t just settle for a stale cup of re-heated brewed coffee. You can’t settle for a cup that doesn’t make your insides melt with the delight. Here’s what I learned in all the years that I’ve become dependent on caffeine, never settle for less. Sometimes coffee shops can be a total rip-off and you end up spending too much on a cup of coffee that isn’t even worth it. Before you realized it, they rip you off so bad that you realized that they weren’t as budget-friendly as they seemed to be. Caffeine had always been my most expensive decision. Befriending that barista had been the most life-changing one though. 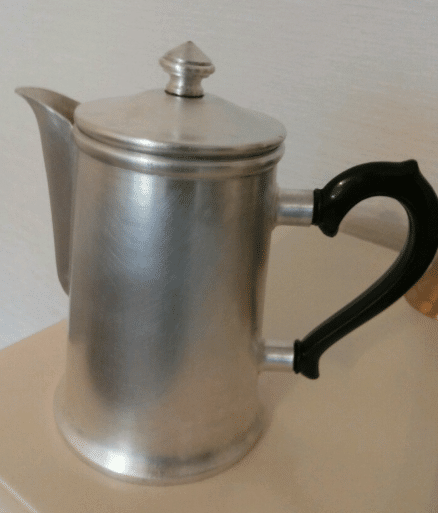 Had I not have had the conversation that I did with her, then I would never have been introduced to the pour-over coffee method and I would never have known of the existence of the gooseneck coffee pot. I know that it might make your house look like a café with having one sitting on your stove-top in the kitchen, but it isn’t something I regretted since the day of my purchase. Now every time that I make myself a cup of coffee, I’m thoroughly assured that I’m going to have the best cup. So maybe finding the right one isn’t the easiest job to do and sometimes you will end up with a product that is defective or doesn’t last very long and warranty wouldn’t help you. But know in your heart that you’re making a good decision by purchasing one. But if you don’t mind the fact that your budget is being spent on too much coffee in overpriced cafes and non-quality coffee, then maybe I wasn’t much help to you. However, if you’re like me who has come to a startling realization of how much money you spend on coffee, then I surely do hope that I’ve enlightened you with this review. The gooseneck kettle was the best coffee-centered decision I’ve ever made in my life and I do hope that it would be yours too. 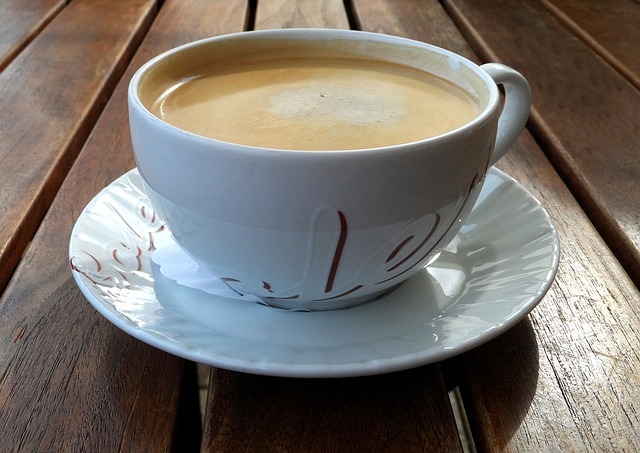 Trust me, having a cup of consistent coffee will always be the best decision made ever!